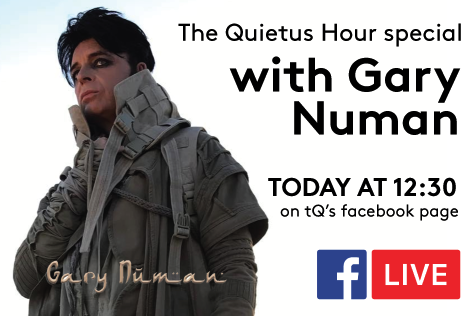 Gary Numan is set feature as the special guest on this week's edition of The Quietus Hour, and you can get your questions in to him for the show at lunchtime today (July 31). Our own John Doran will be talking to Numan via Facebook from midday and you can get your questions put to him live throughout the chat too if you so wish by commenting just below the stream when it goes live. If you want to make sure you don't miss the live stream, just head over to our Facebook page here and make sure that you have notifications set to 'On' underneath the 'Following' tab on the page. If you would like to send your questions in ahead of the stream, you can do so by replying to this tweet. The final edition of the show will be available to listen back to as a podcast from this Thursday (August 3). Numan will be joining us ahead of the release in September of his 22nd studio album, Savage: Songs From A Broken World. Taking inspiration from a series of dismal world events such as the election of Donald Trump, the album has been described as carrying a "narrative that’s set in an apocalyptic, post-global warming Earth in the not-too-distant future". The album is out on September 15 and Numan will back its release with an extensive UK and European tour. To check the list of dates, head here..